Shuttle photo courtesy S. L. Nusbaum Realty Co.
For the latest in office tenant amenities look no further than downtown Norfolk. Wells Fargo Center has started a complimentary shuttle service exclusively for the use of its office tower tenants. 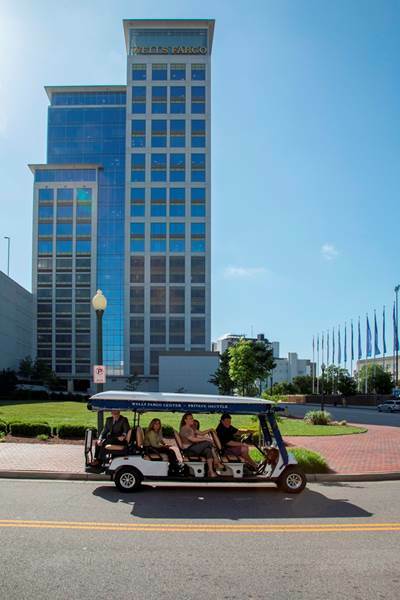 Launched on April 30, Wells Fargo says the shuttle is the first of its kind for office buildings in downtown Norfolk and that it has generated significant use, about 21 passengers per day. The Wells Fargo Center owns the shuttle, and the driver is an employee of the building. “We find the service very convenient, allowing us to experience downtown more completely,” Guy Gentry, director and branch manager of UBS Financial, said in a statement. Whether tenants want to visit Waterside, meet a client at The Main, dine at a favorite spot on Granby Street, or head over to Town Point Park, the private shuttle provides a convenient way to get around. “The shuttle service is awesome. I have used it 4 to 5 times since it has started,” Greg Harris, financial advisor, first vice president-investments, Wells Fargo Advisors, said in a statement. The service is available from 11:30 a.m. to 6 p.m. Monday through Friday. Located at 440 Monticello Ave., adjacent to MacArthur Center Mall, the Wells Fargo Center is a mixed-use development. The 23-story, 255,000 square-foot building offers 50,000 square feet of retail space, 1,859 parking spaces and 121 luxury apartments.